A Conservative MP has been suspended from the party after it emerged she used a racist expression during a public discussion about Brexit. Anne Marie Morris, the MP for Newton Abbot, used the phrase at an event in London to describe the prospect of the UK leaving the EU without a deal. The Conservative Party later confirmed she had had the whip withdrawn. Announcing the suspension, Theresa May said she was “shocked” by the “completely unacceptable” language. “I immediately asked the chief whip to suspend the party whip,” she said in a statement. 10. How on earth do you become an MP while being so stupid as to use the N-word at a public event? 12. I mean, come on, aren’t these the same people who go on about political correctness gone mad? 13. Anne Marie Morris presumably had to defeat at least one other person to be selected as the Conservative candidate. 14.Imagine how rubbish you must be to lose to someone who uses the word “n****r” at a meeting in 2017. 15. Anne Marie Morris is 60. Given the damage done, it’s hard to see how Morris can regain the Tory whip, no matter what the ‘investigation’ by Tory campaigns HQ concludes. Which raises the issue of whether she will be booted out for good, and whether she would quit to trigger a by-election. Her majority in her west country seat is 17,000. But as this year has taught everyone, electoral norms can be upended. Morris had already been forced to distance herself from her electoral agent and partner Roger Kendrick last month, after he claimed “that the crisis in education was due entirely to non-British born immigrants and their high birth rates’.” Kemi Badenoch, the Tory MP for Saffron Walden, told the Telegraph she spoke to the Chief Whip “to express my dismay, and I am pleased that decisive action has been taken”. Maidstone MP Helen Grant said she was “so ashamed” that a fellow Tory could use the phrase without knowing its history (and it’s an awful history) or impact. Anne Marie Morris – who until this point was best known in the Commons for waving a sling around while wearing Deirdre Barlow’s glasses – used the n-word yesterday at a public meeting. 1. How far we have come in my lifetime. I became politically active in the 1960s — by which I mean I discarded the political attitudes I inherited, and adopted an alternative set. Whether that also means I “started to think for myself” is more debatable. that Harold Wilson was entirely justified in declaring the elected Tory a parliamentary leper. Many Tories were deeply uncomfortable about the elected MP as a fellow: even Enoch Powell (whose “rivers of blood” speech came two years later) refused to campaign with him. that the local Trade Union branches and whatever were not beyond reproach. 2. Just how racist is our language? Put the woodpile (above) aside. We could quibble about “nitty-gritty” (and many have done). Indeed, almost any use of “black” and “white” could be construed as a racist offence, if one was so determined. Philippus aunswered, yt the Macedonians wer feloes of no fyne witte in their termes but altogether grosse, clubbyshe, and rusticall, as they whiche had not the witte to calle a spade by any other name then a spade. Pistol: Die and be damn’d! and figo for thy friendship! Pistol: The fig of Spain! Preferring the epicene, Udall goes for the horticultural reference. The racial slur dates only from the 1920s, and apparently from New York, and specifically Claude McKay’s Home to Harlem (1927). What about “beyond the Pale”? The area of Ireland under English jurisdiction (varying in extent at different times between the late 12th and 16th centuries, but including parts of modern Dublin, Louth, Meath, and Kildare). A plague of flies of “biblical proportions” has descended upon the Dublin 4 suburbs of Sandymount, Ringsend and Irishtown, according to residents and local businesspeople. Labour Senator Kevin Humphreys said he had received “hundreds” of complaints from locals in recent days over the fly infestation, which has forced people to keep their windows shut and resulted in the closure of some businesses. Tony “Deke” McDonald, who runs Deke’s Diner at the Sean Moore Road roundabout in Ringsend, said the infestation was the worst he had ever seen. It didn’t take more than moments for Dublin wit to crack in, saying Ringsend and Irishtown deserved all they got, for social-climbing and pretension to post-code D4. No glass of ours was ever raised. to toast the Queen. Last week, Hong Kong said goodbye to one of the last vestiges of imperialism by covering up the royal insignia on its green post boxes. But is there ever a point when this kind of history is worth preserving? Perhaps you know that things are healing when, after centuries of violent tyranny and pillage, the British empire comes down to arguing over postboxes. In Hong Kong, where 59 of the old colonial postboxes remain, the postal service has announced that it plans to cover the royal insignias with a metal plaque – in order to avoid “confusion”. (The boxes have already been painted green and had the Hong Kong Post’s logo added to them, so you would have to be very confused indeed not to realise what they’re for.) Hong Kong postbox fanciers say that the insignias are “part of Hong Kong’s heritage and daily life”, and plan to protest on Saturday. So are they right? At what point does a bitter colonial history stop needing to be expunged and become, well, just history, that needs actual preservation? Look around the world and you’ll find few clear answers. That is illustrated nowhere better than by standing on the bridge at Belleek. You can see where the tarmac subtly changes colour and texture between the jurisdiction of the County Fermanagh and that of the County Donegal. Behind is the 30 mph sign, ahead is one for 80 km/hr. 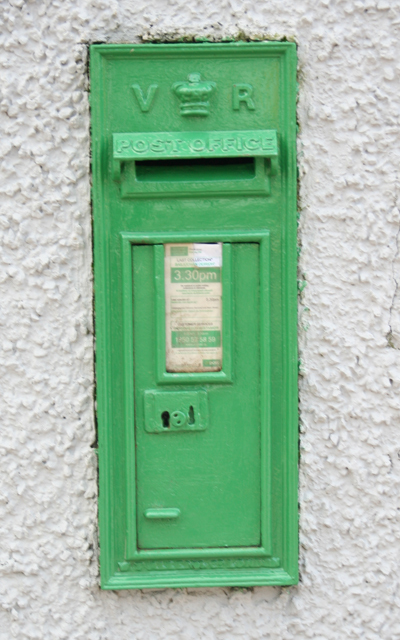 Leave the A47, and head down the N5 for Ballyshannon, and it’s not far before you spot one of the relics of imperialism: a post-box with Queen Victoria’s monogram and crown, painted green. There’s even a precious few of the classic Penfolds around (one was — perhaps still is — in Clonakilty, county Cork). I once bought a Donegal tweed hat in Belleek — it was indeed my “End of Empire hat” (which I eventually lost in the Grand Hotel, Scarborough). I was invited to do the transaction in euros. It’s called “peaceful co-existence”: something that the two administrations, the two cultures of the island of Ireland, especially the Unionists of the North, are still stretching to achieve. It’s a characteristic in much of Andy Pollack’s writings, not least the piece he had on his blog-site in August, The Republic is now a warm place for Protestants, which has finally made it to the print-copy of the Irish Times. I was sure that would no more likely embrace Belleek than Muckle Flugga. I was not disappointed. But a pity: had he gone, he might have learned something. He could be describing the old Irish Times newsroom, up the stairs, just off D’Olier Street, and convenient for the Palace Bar in Fleet Street. Every good story needs an antagonist, against whom the protagonist contends. I’m going to make R.M. “Bertie” Smyllie, for twenty years the editor of the Irish Times, my protagonist hero here. So for the hissable villain of the piece I need a conflation of Joseph Walshe (de Valera’s reliable go-fer at External Affairs), Thomas Coyne (a big-wig in the Department of Justice, licensed to implement wartime censorship) and Michael Knightly (chief press censor). Walshe was a man on a mission — not just to serve assiduously his political master — to elevate Ireland as the Christian state that would take a very real part in bringing about a cessation of hostilities. The idea was to mobilise the other small European states, and the Vatican in particular. Good stuff, Joe! (provided we overlook that meant cuddling up to Pius XII Pacelli, Salazar’s Portugal and even Franco’s Spain). Public opinion must be built up on a neutral basis, a neutral-mindedness must be created. A list of the states which are neutral should be frequently and prominently displayed in the Press. The advantages of being neutral should be stressed. The losses and sufferings of all kinds, including famine and poverty, which come upon countries at was should be expressed. The greatest danger, in my opinion, to our neutrality, and conceivably to our continued existence as a State, is the subtle propaganda of an ascendance clique which will undoubtedly use this occasion to promote their dearest wish which is to bring the British back. When a certain paper says, for instance, that the irishmen who joined the British Army in 1914 were the real Irish patriots and the cream of our people, it is essentially a principle completely opposed to the continued existence of an Irish State. Such views should be ruthlessly suppressed. “Bertie” Smyllie had evolved the Irish Times from being the mouthpiece of imperial Dublin Castle into a true, small-l liberal paper of record (to the angst of many Colonel O’Blimps), and one with an international perspective unique in Irish journalism. That had to stop, and Michael Knightly was the man for the task. Smyllie and Knightly waged a day-by-day, hand-to-hand from September 1939 to the following January. Only then, under threat of infinite suspension, did Smyllie concede. After that all matter had to be pre-submitted to Knightly’s office. Apart from the crackles and pops of BBC transmissions, Ireland had become a one-voice media operation. Already, when the Farmers Federation went on a dairy-products strike, it was kept out of the papers for three days (Dubliners knew the cause: that came down the supply chain very effectively) — and the Offences against the State Act was invoked. 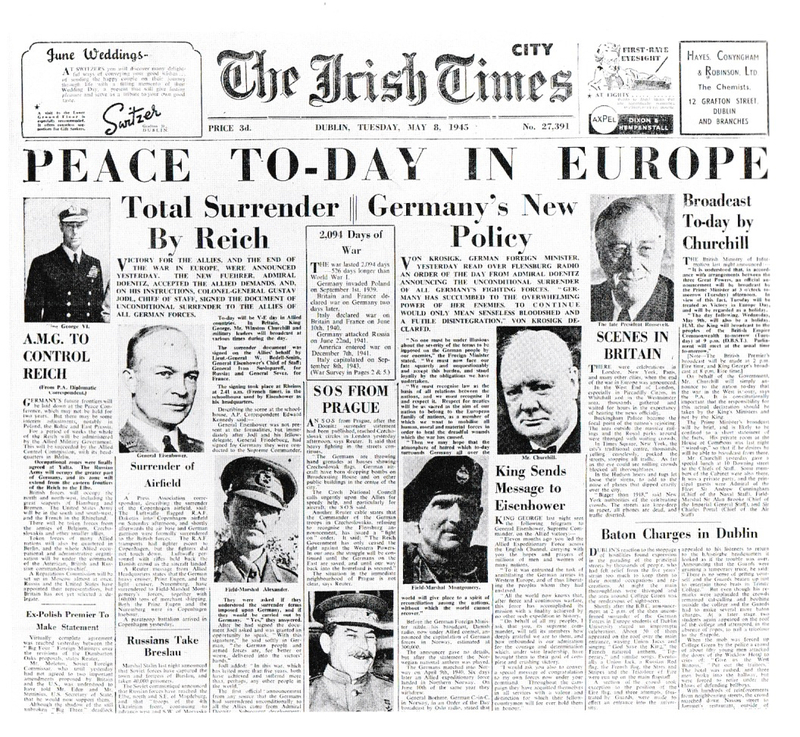 … a framed original of Smyllie’s famous VE Day front page from May 8th, 1945. At the time, the newspaper was subject to government censorship, the blue pencil scoring out any hint of partisanship. But with the censor gone home for the night, Smyllie tore up the approved front page and remade one that included seven small photographs – showing King George, President Roosevelt, Winston Churchill, Joseph Stalin, General Eisenhower, and Field Marshals Alexander and Montgomery – arranged in a giant V (for victory) shape across the page. In either incarnation, as myself or as pseudonym, I do not appear in any. My circle at TCD in the early 1960s was as active, as interesting, as complex, as talented (if not more so) as that exclusive world of ex-pat, West Brit jeunesse dorée she celebrates. Where she, and her set, mentally resided (mainly in Kensington and the English Home Counties, with the odd baronial pad), we were merely the spear-carriers, the walk-on parts, who flitted across the screen to add texture. Trinity was more like an Oxbridge college than a university: you could know “everyone”. And this is what Anne Leonard has shown us in her three volumes, the most recent, Portrait of an Era, a superb visual record of what Trinity was like in the 1960s, with essays and photos by students of students, of scholars, of staff, of President de Valera, of events, cars, fashion, Players, Trinity Week, Dublin pubs, sport, porters in their archaic uniforms, a time when all male students dressed in jacket and tie, and women only wore dresses, men living in college having to attend Commons in their black gowns every weeknight, and when roll calls preceded each lecture and all students had to attend six sevenths of those given in each seven-week term. 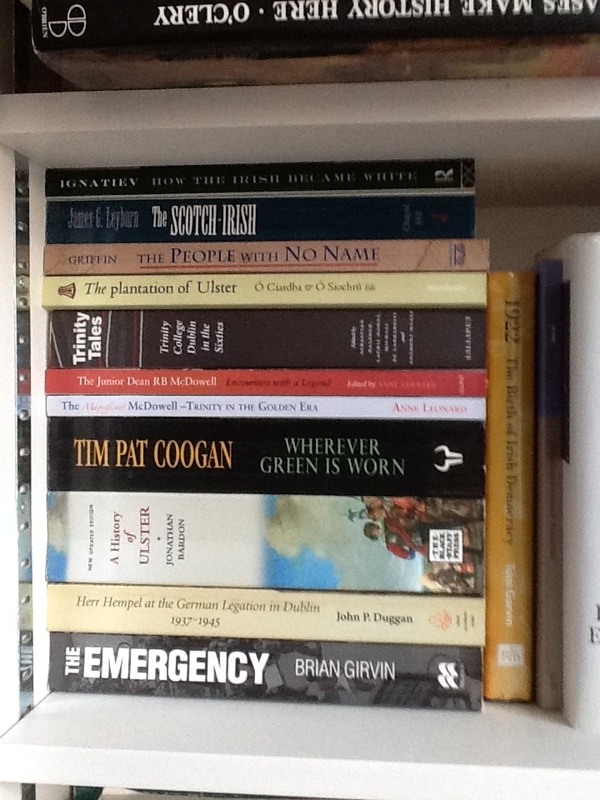 The reason for that is my Trinity was definitively in Dublin, in Ireland, and not semi-adjacent to the Kings’s Road. We were not wholly taken by cars, fashion, Players, Trinity Week. Actually, one year we had our own anti-Ball party, which (as I recall) involved drinking bottled beer in the Dublin mountains and watching the sun-rise over Dun Laoghaire. I admit I had a tie, and wore it occasionally — though my “jacket” may have been a donkey-jacket. 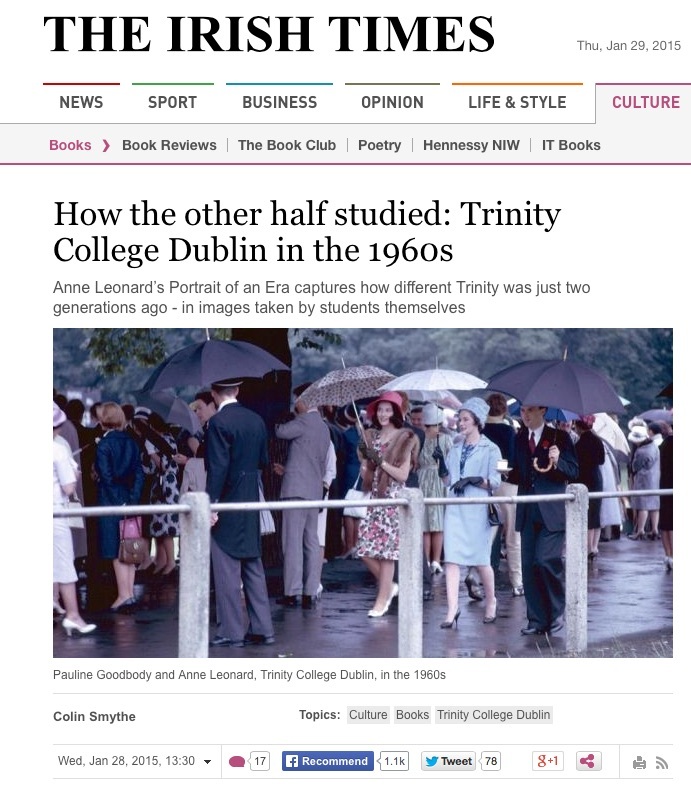 Far more TCD students at that time were Irish and Northern Irish than Ms Leonard, MBE, cares to recognise. Our concerns and interests were not exclusively English. Most of us could not afford the rents of rooms in College: mine was a cold-water flat in a Ballsbridge basement (sanitary arrangements irregular, but hat-tip to the Edwardian bath-house off Botany Bay). We used bars which were not the Bailey or the International: mine was the corner bar of O’Neill’s in Suffolk Street. We ate at joints like the Universal Chinese restaurant in Wicklow Street, when we could afford to — and bread-and-processed cheese when we couldn’t. We travelled by Dublin Corporation bus. We swilled endless quantities of Maxwell House instant coffee. We argued incessantly about things that mattered: Cuba, Irish membership of the EEC, CND, the Black North under the Brookelborough mal-administration. While Ms Leonard, MBE, and her associates and supporting Players, everyone der biedere Mann, reckoned Max Frisch and The Fire Raisers were the last word on world politics, the TCD Fabians were involved in the Universities Branch of the (Irish) Labour Party, and even reaching out to the assorted odd-balls of Queen’s Labour Group. Ms Leonard, MBE, writes about her little self-anointed élite: they were, and as these books show, more effete. Ever since Oxford and Cambridge Joint Board GCE English Language A made us explain “what is wrong in the following sentences?”, I’m a fan of weird misplaced modifiers. The antique dealer put her large chest at the front of the shop. Henry VIII wanted a divorce because his wife wouldn’t give him a son. So he asked the Pope, who wouldn’t give him one either. Catching der Geist seiner Zeit (that’s yer proper Georg Hegel, that is — we give full value here at Malcolm Redfellow’s Home Service), the BBC website has a quick potted history of commercial aircraft downed by “enemy action”. In addition to the on-going crisis over MH17, the piece cites just five other examples since 1954. May I suggest a sixth? Aer Lingus Viscount EI-AOM, St Phelim, which crashed into the sea off the Tuskar Rock, on 24th March 1968. All 61 on board — 57 passengers and four crew — were killed. There is not enough evidence available on which to reach a conclusion of reasonable probability as to the initial cause of this accident. The probable cause of the final impact with the sea was impairment of the controllability of the aircraft in the fore and aft (pitching) plane. For thirty-odd years there was speculation that the missile research base at Aberporth was just too conveniently nearby, and a rogue missile may have been involved — not necessarily as a direct hit, but close enough to upset control of the Viscount. Oddly enough, as late as 1999 the Aberporth records were recovered, to show (what a surprise!) no test firings that day. We should not speculate on how some British government records may be helpfully unearthed, while others — less convenient — remain missing. 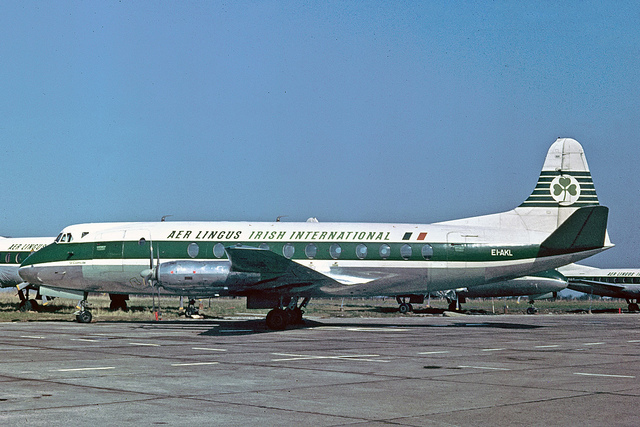 A retired British air force flying instructor claims that the 1968 Tuskar Rock Aer Lingus Viscount plane crash was caused by a collision with a French-built military aircraft which was training with the Air Corps. The aircraft struck each other accidentally while the Fouga Magister trainer was responding to a request to check the Viscount’s undercarriage, RAF Squadron Leader Eric Evers maintains. All 61 people, including the four crew, on board the Aer Lingus Viscount Cork-London Heathrow flight died in the subsequent crash off Tuskar Rock, but the two pilots in the trainer survived by ejecting and parachuting to safety, he claims. Both the French and Irish authorities colluded in a subsequent cover-up, he says, and the Fouga Magister wreckage may still be on the seabed off Co Wexford. A Defence Forces spokesman described the claims as “spurious” and said there was no evidence that an Air Corps plane was in the vicinity at the time. The spokesman said that Fouga Magisters did not “come into service” with the Air Corps until 1976. He could not comment on why a Fouga Magister was listed as one of the Air Corps aircraft in service in 1968, as stated in appendix 5.2.g of the 2002 report.